A wonderful week of visiting family and preparing the camper for it’s return visit to the West coast. 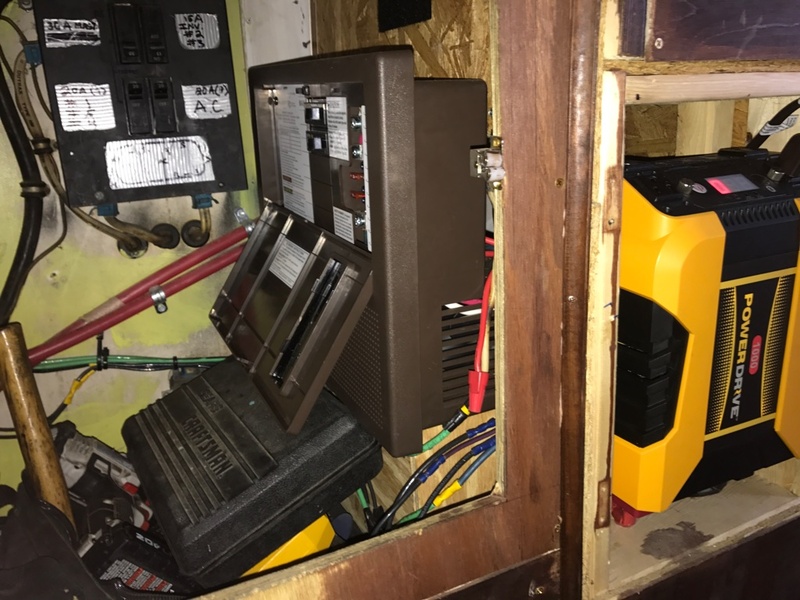 A large portion of that prep involved a major overhaul of the electrical stuff in traytray. Sunday morning we were fed a mighty fine breakfast by the folks. We ran our final crosscheck & tested the brakes. Hopeful farewells and hugs all around. After just over six months of house selling stress and careful preparation, were finally on our way. We waved at my Dad and Ivy as we drove by the RV park….how many times does a person leave home? I for one sure feel like I have done a lot of it in my life. As we rolled through Tulsa we decided to stop and switch out a brake pad I was having trouble with… in record time (20 minutes) we were back on the road, perhaps I missed my NASCAR calling. We drove about five hours to Lyons, Kansas. Camper Tip! : Lyons has a great free public RV park with full electric and bathrooms with showers! A wonderful quiet spot. We were tracked down….or I should say Frankie was tracked down by a pack of roving children! Frankie was no longer annoyed after mom called them back across the road. The next morning in a light rain we dropped the windows, stowed our stuff, and set out for Flagler, Colorado. It is situated about 5 hours West-North-West of Lyons. Along the way we made a very important stop; Cate had to see the worlds largest easel, upon which was an enormous reproduction of Van Gogh’s Three Sunflowers. Shortly thereafter, we trundled down a dirt road through a sheep farm and arrived at Flagler Wildlife Area and Reservoir. Nary a soul was to be found next to the beautiful large still pond. Great clouds stretched across the prairie and a light breeze blew. We parked on a bed of close-cut grass that looked for all the world like a putting green. 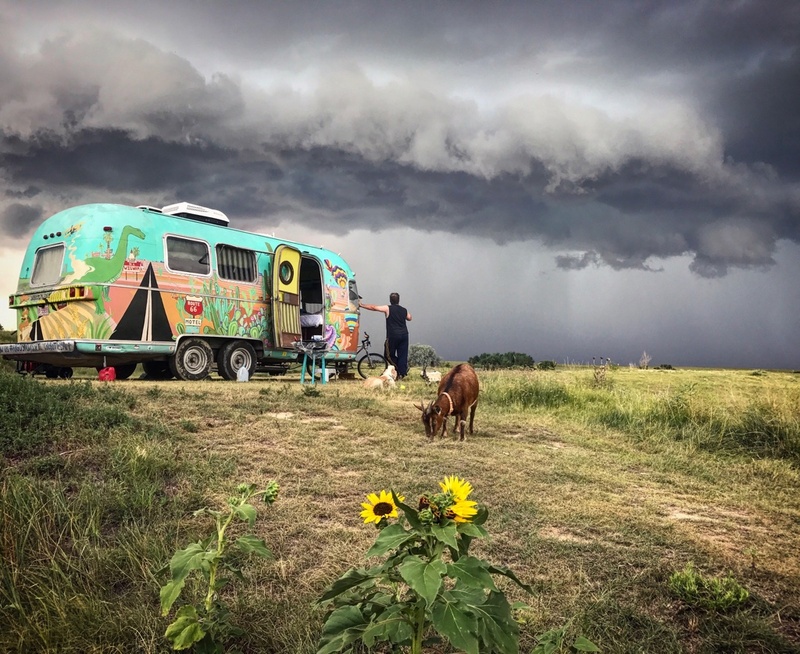 Later we watched as the dark clouds swirled overhead and we soon were beset by a raging afternoon thunderstorm with pea sized hail, torrential rain, and what I would guess were 70mph gusts that buffeted the trailer. It was a reminder that we were really on the road, self sufficient, our little camper our only shelter, and like that day, we don’t even always have cell service in case of problems. The skies soon cleared and we witnessed a wonderful plains sunset and ate dinner while watching the swallows skim the lake in the fading light. We awoke this morning to an incredible sunrise and prepared for our drive to Rocky Mountain National Park! Previous Post:The Journey Continues! With a Goat! Next Post:The little engine that could… the little couple that would. Amazing storm footage… Did your vehicle or trailer receive any damage? No damage Rainey! Thankfully…. thought we might roll over though.